Some people with type 2 diabetes want to get creative when it comes to finding a way to treat their symptoms. There are many alternative treatments available for lowering a person’s blood sugar and decreasing their risk of congestive heart failure and stroke. One just needs to go searching for which therapy works best for them. While these natural remedies may be great for improving diabetes symptoms, they are generally not a replacement for medication. Before you attempt them, it’s important to consult a doctor about whether an alternative therapy will be the best for you. One reason people seek out alternative therapies is because many do not include the side effects of Actos and other medications. Some drugs for type 2 diabetes can be very hard on the body. A type 2 medication called Actos will actually increase the risk of bladder cancer by 83 percent. Because many alternative treatments for type 2 diabetes focus on natural remedies like reducing stress and losing weight, there is much less risk of potential injury when practicing alternative treatment. 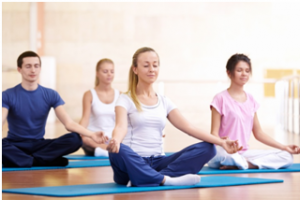 Yoga is a fantastic alternative therapy for type 2 diabetes because it causes people to lose weight and releases stress. These are two major factors that affect people with type 2. With excess blood sugar in their arteries and veins, the heart in a person with diabetes has to work harder to pump. It may even eventually weaken and cause congestive heart failure or heart attack. An easy yoga routine is a good low-impact exercise that burns calories and improves blood flow. Yoga also helps relieve stress that puts strain on the heart by increasing blood pressure. By experiencing the relaxing effect of yoga, people with type 2 diabetes will experience many benefits besides just improved heart health. People with less stress often eat and sleep better, so relaxation not only increases weight loss but also improves overall state of mind. In acupuncture, thin needles are inserted in specific places on a person’s skin. This treatment is supposed to set off the body’s pain-killing hormones. It is sometimes used for people with diabetes who experience neuropathy — nerve damage caused by prolonged high blood sugar. Side effects often lead people to seek painkillers when they experience symptoms of discomfort, numbness and tingling. Because painkilling medication can be addictive, some people with type 2 diabetes use acupuncture as an alternative treatment. Acupuncture can help diabetes by reducing stress. It may even lower blood sugar. Some studies suggest cinnamon, coffee and cloves can increase insulin, but just how effective certain plants are at lowering blood sugar remains to be seen. In general, vegetables and foods that are high in fiber help slow the digestion of sugar. Foods like peas, okra, broccoli, brewer’s yeast and buckwheat are great for people with type 2 diabetes because they provide a lot of nutrition without raising blood sugar very much.